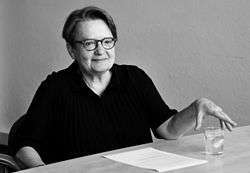 Agnieszka Holland (born 28 November 1948) is a Polish film and television director and screenwriter. Best known for her political contributions to Polish cinema, Holland is one of Poland's most eminent filmmakers. She began her career as assistant to directors Krzysztof Zanussi and Andrzej Wajda, and emigrated to France shortly before the 1981 imposition of the martial law in Poland. Holland is best known for her films Europa Europa (1991) and her 2011 drama In Darkness, which was nominated for Best Foreign Language Film at the 84th Academy Awards. Holland was born in Warsaw, Poland in 1948. She is the daughter of journalists Irena (née Rybczyńska) and Henryk Holland. Holland's mother was Catholic and her father Jewish, but she was not brought up in any religious faith. Her father was a member of the Communist Party of Poland who served in the Red Army during World War II. After the war, he returned to Stalinist Poland and wrote propaganda articles attacking the Polish underground Home Army. His own parents were killed in the Warsaw Ghetto; Holland's mother participated in the 1944 Warsaw Uprising as a member of the Polish resistance movement. Holland's Catholic mother aided several Jews during the Holocaust and received the Righteous Among the Nations medal from the Yad Vashem Institute in Israel. Holland was often ill as a child, and spent much of her time writing, drawing and directing short plays with other children. Holland's father died under police interrogation when she was 13 years old. Although official reports labeled his death a suicide, his family and others believe he was murdered by the communist police, by defenestration. Holland’s mother later married journalist Stanislaw Brodzki. Holland attended the Stefan Batory Gymnasium and Lyceum in Warsaw. After high school, she studied at the Film and TV School of the Academy of Performing Arts in Prague (FAMU) because, as she said in an interview, she thought the Czechoslovak films of the 1960s were very interesting: "I watched first films of Miloš Forman, Ivan Passer, and Vera Chytilova. They seemed to be fantastically interesting to me, unlike what was being made in Poland at that time". At FAMU, she also met her future husband and fellow director, Laco Adamik. Holland witnessed the Prague Spring of 1968 while in Czechoslovakia, and was arrested for her support of the dissident movement for the government reforms and political liberalization. Holland graduated from FAMU in 1971. Her daughter with Adamik, Kasia (born 28 December 1972), is also a director. Holland began her career as an assistant director for Polish film directors Krzysztof Zanussi and Andrzej Wajda. Her credits include Zanussi's 1973 film, Iluminacja (Illumination), and Wajda's 1983 film, Danton. She was first assistant director on Wajda’s 1976 Man of Marble, an experience which gave her the capability to explore political and moral issues within the confines of an oppressive regime. Her first major film was Provincial Actors (Aktorzy Prowincjonalni), a 1978 chronicle of tense backstage relations within a small-town theater company which was an allegory of Poland's contemporary political situation. It won the International Critics Prize at the 1980 Cannes Film Festival. Holland directed two more major films in Poland, Fever (Gorączka, 1980, entered in the 31st Berlin International Film Festival) and A Lonely Woman (Kobieta samotna) in 1981, before emigrating to France shortly before the December 1981 imposition of martial law in Poland. She was told that she could not return to Poland, and was unable to see or even have any contact with her daughter for over eight months. Knowing she could not return to communist Poland, Holland wrote scripts for fellow Polish filmmakers in exile: Wajda's Danton, A Love in Germany (1983), The Possessed (1988) and Korczak (1990). She also developed her own projects with Western European production companies, directing Angry Harvest (1985), To Kill a Priest (1988) and Olivier, Olivier (1992). Holland received an Academy Award nomination for Best Foreign Language Film for Angry Harvest, a German production about a Jewish woman on the run during World War II. Holland's best-known film may be Europa Europa (1991), which was based on the life of Solomon Perel (a Jewish teenager who fled Germany for Poland after Kristallnacht in 1938). At the outbreak of World War II and the German invasion of Poland, Perel fled to the Soviet-occupied section of the country. Captured during the German invasion of the USSR in 1941, Solomon convinced a German officer that he was German and found himself enrolled in the Hitler Youth. The film received a lukewarm reception in Germany, and the German Oscar selection committee did not submit it for the 1991 Best Foreign Language Film Oscar. However, it attracted the attention of Michael Barker (who handled Orion Classics’ sales at the time). Europa, Europa was released in the United States, winning the 1991 Golden Globe Award for Best Foreign Language Film and an Oscar nomination for best adapted screenplay. Holland's later films include Olivier, Olivier (1992), The Secret Garden (1993), Total Eclipse (1995), Washington Square (1997), the HBO production Shot in the Heart (2001), Julie Walking Home (2001), and Copying Beethoven (2006). In a 1997 interview, when asked how her experiences as a director have influenced her films, Holland said “filmmakers of the younger generation lack life experience” and, as a result, lack many of the tools needed to breathe humanity into their characters. Compared to directors of her generation, she feels that the younger generation comes from wealthy families, goes straight to film schools and watches movies primarily on videotape. Holland suggests that this results in what she calls a “numbness” and “conventionalization” of contemporary cinema. In 2003, Holland was a member of the jury at the 25th Moscow International Film Festival. The following year she directed "Moral Midgetry", the eighth episode of the third season of the HBO drama series The Wire. In 2006, Holland returned to direct the eighth episode of the fourth season ("Corner Boys"). Both were written by novelist Richard Price. Show runner David Simon said that Holland was "wonderful behind the camera" and staged the fight between Avon Barksdale and Stringer Bell in "Moral Midgetry" well. In 2007 Holland, her sister Magdalena Łazarkiewicz and her daughter Katarzyna Adamik directed the Polish political drama series Ekipa, and in 2008 Holland became the first president of the Polish Film Academy. On 5 February 2009, the Krakow Post reported that Holland would direct a biopic about Krystyna Skarbek entitled Christine: War My Love. Her 2011 film, In Darkness, was selected as the Polish entry for the Best Foreign Language Film at the 84th Academy Awards. In January 2012, the film was one of the five nominees. Holland accepted an offer to film a three-part drama for HBO about Jan Palach, who immolated himself in January 1969 to protest "normalization" after the Warsaw Pact invasion of Czechoslovakia in August 1968. The resulting miniseries, Burning Bush, has been shown in Poland and Germany and selected for a Special Presentation screening at the 2013 Toronto International Film Festival. On 1 December 2013, the film screened at the National Gallery of Art in Washington, DC, where Holland was invited to deliver the Rajiv Vaidya Memorial Lecture: Viewing History through the Filmmaker's Lens. It was also shown at the 2013 Philadelphia Film Festival. Holland was a guest speaker at Brooklyn College. In December 2013, Holland was announced as director of NBC's next miniseries Rosemary's Baby, a two-part version of the best selling novel by Ira Levin with Zoe Saldana. Agnieszka Holland took over the chairmanship of the European Film Academy board in January 2014. In March 2016, it was announced that Holland is set to direct an adaptation of Peter Swanson's best-selling novel The Kind Worth Killing, a psychological thriller about a ruthless female killer. Quart, Barbara Koenig (1988). Women Directors: The Emergence of a New Cinema. New York: Praeger. ISBN 0-275-93477-2. Agnieszka Holland, "Viewing History through the Filmmaker's Lens," lecture delivered December 1, 2013, at the National Gallery of Art, Washington DC. 1 2 "Kasia Adamik". Film Polski. Retrieved 16 February 2014. 1 2 "Oscars 2012: Nominees in full". Retrieved 24 November 2015. ↑ Agnieszka Holland profile, FilmReference.com; accessed 24 November 2015. ↑ Stanisław Michalkiewicz, Stalinięta straszą, by powrócić Bibula, 25 June 2010; "Jak wiadomo, terror był wówczas zjawiskiem codziennym, a towarzyszyła mu oszczercza, czarna propaganda, w której – tak się akurat złożyło – specjalizował się ojciec pani Agnieszki, Henryk Holland. Zasłynął on bowiem podówczas z publikacji szkalujących Armię Krajową i jej żołnierzy, którzy – jeśli nie zostali zamordowani, to właśnie gnili w więzieniach." 1 2 3 4 Tibbets, John and Agnieszka Holland. “The Interview with Agnieszka Holland: The Politics of Ambiguity”, Quarterly Review of Film and Video. 25:2, pp. 132-43. ↑ "Berlinale 1981: Prize Winners". berlinale.de. Retrieved August 29, 2010. ↑ "The 58th Academy Awards (1986) Nominees and Winners". oscars.org. Retrieved November 10, 2013. ↑ "25th Moscow International Film Festival (2003)". MIFF. Retrieved 1 April 2013. 1 2 Agnieszka Holland, David Simon (story), Richard Price (story and teleplay) (14 November 2004). "Moral Midgetry". The Wire. Season 3. Episode 08. HBO. 1 2 "Episode guide - episode 33 Moral Midgetry". HBO. 2004. Retrieved 9 August 2006. ↑ "The Wire season 3 crew". HBO. 2007. Archived from the original on October 12, 2007. Retrieved 14 October 2007. 1 2 Agnieszka Holland, Ed Burns (story), Richard Price (story and teleplay) (5 November 2004). "Corner Boys". The Wire. Season 4. Episode 08. HBO | station. 1 2 "Episode guide - episode 45 Corner Boys". HBO. 2006. Retrieved 9 November 2006. ↑ "The Wire season 4 crew". HBO. 2007. Archived from the original on October 12, 2007. Retrieved 14 October 2007. ↑ Krakow Post re film to be made of Krystyna Skarbek/Christine Granville's life by A. Holland Archived April 1, 2009, at the Wayback Machine., krakowpost.com; accessed 24 November 2015. ↑ "Poland to Submit Agnieszka Holland's In Darkness for Oscars". indiewire.com. Retrieved 22 August 2011. ↑ "Beta Film Acquires Agnieszka Holland's Burning Bush". ↑ "Burning Bush". TIFF. Archived from the original on August 30, 2013. Retrieved 7 August 2013. 1 2 Holland, Agnieszka (1 December 2013). "Rajiv Vaidya Memorial Lecture 2013: Viewing History Through the Filmmaker's Lens". nga.gov (Streaming audio recording). National Gallery of Art. Retrieved 28 August 2015. 1 2 Holland, Agnieszka (1 December 2013). "Transcript - "Viewing History through the Filmmaker's Lens"" (PDF). nga.gov. National Gallery of Art. Retrieved 28 August 2015. ↑ "Agnieszka Holland Directs NBC Miniseries: Rosemary's Baby". Culture.pl. Retrieved 12 December 2013. ↑ "New EFA Board". EFA. Retrieved 12 December 2013. ↑ Mike Fleming Jr. (16 March 2016). "Agnieszka Holland Set To Helm 'The Kind Worth Killing'". Deadline Hollywood (Deadline.com). Penske Media Corporation. Retrieved 18 March 2016. ↑ Agnieszka Holland, David Mills (story and teleplay), David Simon (story) (February 3, 2008). "React Quotes". The Wire. Season 5. Episode 5. HBO. ↑ "The Wire episode guide - episode 55 React Quotes". HBO. 2008. Archived from the original on February 5, 2008. Retrieved February 5, 2008. ↑ "Archived copy". Archived from the original on March 17, 2013. Retrieved 2013-02-01.